A comprehensive textbook from an established and high profile author team, which offers full coverage of PR theory and strategies, whilst also giving practical guidance for anyone in a PR role. New edition includes extended coverage of digital marketing, a stronger theoretical grounding and updated international case studies throughout. 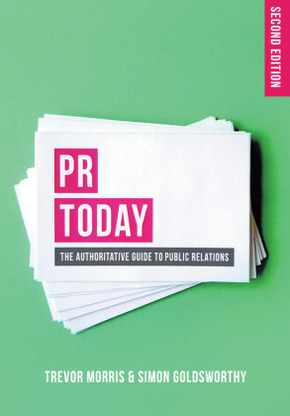 This new and fully-updated second edition of this acclaimed textbook offers a guide to public relations, spanning all aspects of PR work, including fashion, event management, crisis communications, politics, celebrity PR and corporate communications, and takes account of the rapid change in the PR industry. It It combines essential practical guidance with a thought-provoking analysis of this exciting but enigmatic industry, its ethical dilemmas and the role it plays in the contemporary world-not least its controversial but crucial relationship with the media. PR Today offers a fresh, lively and realistic perspective on its subject, based on the authors' rare combination of international top-level experience, insider knowledge and years of teaching and writing about PR. It will be invaluable for students taking public relations at undergraduate and postgraduate levels and essential reading for those seeking to start a career in this dynamic, fast-growing profession. PART I: THEORY AND ANALYSIS.- 1. Understanding Public Relations.- 2. PR Ethics.- 3. The Make-Up of the PR Industry.- 4. PR, Marketing and Advertising.- 5. Internal Communications.- 6. Lobbying, Political and Government PR.- 7. PR in the Online World.- 8. Corporate Social Responsibility.- 9. PR and the Law.- PART II: PLANNING AND STRATEGY.- 10. POSTAR: Positioning, Objectives, Strategy, Tactics, Administration, Results.- PART III: PRACTICE.- 11. Presenting, Pitching and Public Speaking.- 12. PR Media Skills.- 13. Event Management.- 14. Crisis Management.- PART IV: CONCLUSION.- 15. Public Relations: Into the Future. 'If you read just one book on PR, read this. In an industry full of self-important bogus theory and pretension, Morris and Goldsworthy tell it how it really is. Worth more than any number of lectures. Buy it.' - Francis Ingham, Director General , Public Relations Consultants Association and Chief Executive, International Communications Consultancy Organisation.